This article is about fire and the fire god in Indian religions. For other uses, see Agni (disambiguation). Agni (Sanskrit: अग्नि, pronounced English: /ˈægni/ AG-nee) means fire, and connotes the Vedic fire god of Hinduism. Agni also refers to one of the guardian deities of direction, who is typically found in southeast corners of Hindu temples. In classical cosmology of Indian religions, Agni as fire has been one of the five inert impermanent constituents (Dhatus) along with space (Akasa), water (Ap), air (Vayu) and earth (Prithvi), the five combining to form the empirically perceived material existence (Prakriti). In the Vedic literature, Agni is a major and oft invoked god along with Indra and Soma. Agni is considered as the mouth of the gods and goddesses, and the medium that conveys offerings to them in a homa (votive ritual). He is conceptualized in ancient Hindu texts to exist at three levels, on earth as fire, in atmosphere as lightning, and in the sky as sun. This triple presence connects him as the messenger between gods and human beings in the Vedic thought. The relative importance of Agni declined in the post-Vedic era, as he was internalized and his identity evolved to metaphorically represent all transformative energy and knowledge in the Upanishads and later Hindu literature. Agni remains an integral part of Hindu traditions, such as being the central witness of the rite-of-passage ritual in traditional Hindu weddings called Saptapadi or Agnipradakshinam (seven steps and mutual vows), as well being part of Diya (lamp) in festivals such as Diwali and Aarti in Puja. Agni (Pali: Aggi) is a term that appears extensively in Buddhist texts, and in the literature related to the Senika heresy debate within the Buddhist traditions. In the ancient Jainism thought, Agni (fire) contains soul and fire-bodied beings, additionally appears as Agni-kumara or "fire princes" in its theory of rebirth and a class of reincarnated beings, and is discussed in its texts with the equivalent term Tejas. Agni (fire) is a part of major rites-of-passage rituals such as weddings and cremation in Indian religions. The Sanskrit word Agni means "fire". In the early Vedic literature, Agni primarily connotes the fire as a god, one reflecting the primordial powers to consume, transform and convey. 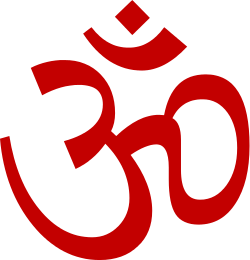 Yet the term is also used with the meaning of a Mahabhuta (constitutive substance), one of five that the earliest Vedic thinkers believed to constitute material existence, and that later Vedic thinkers such as Kanada and Kapila expanded widely, namely Akasha (ether, space), Vayu (air), Ap (water), Prithvi (earth) and Agni (fire). The word Agni is used in many contexts, ranging from the fire in stomach, the cooking fire in a home, the sacrificial fire in an altar, the fire of cremation, the fire of rebirth, the fire in the energetic saps concealed within plants, the atmospheric fire in lightning and the celestial fire in the sun. In the Brahmanas layer of the Vedas, such as in section 5.2.3 of Shatapatha Brahmana, Agni represents all the gods, all concepts of spiritual energy that permeates everything in the universe. In the Upanishads and post-Vedic literature, Agni additionally became a metaphor for immortal principle in man, and any energy or knowledge that consumes and dispels a state of darkness, transforms and procreates an enlightened state of existence. from agnir, which means "leader, guide, going in front", based on the Vedic premise that fire leads and is the chaplain of the gods. He is the divine priest, who connects and brings the gods and men together, the first among all gods whose presence can be felt and who attends a ceremony, the first among all priests around whom other priests gather, he is the one who leads and guides all men. from agri, the root of which means "first", referring to "that first in the universe to arise" or "fire" according to Shatapatha Brahmana section 6.1.1; the Brahmana claims this is cryptically called as Agni because everyone including the gods are known to love short nicknames. according to the 5th-century BCE Sanskrit text Nirukta-Nighantu in section 7.14, sage Śakapūṇi states the word Agni is derived from three verbs – from 'going', from 'shining or burning', and from 'leading'; the letter "a" (अ) is from root "i" which he claims implies 'to go', the letter "g" (ग्) is from the root "añj" meaning 'to shine' or "dah" meaning 'to burn', and the last letter is by itself the root "nī" (नी) which means 'to lead'. from root aj, which in Sanskrit means "to drive" and mirrors in Indo-European languages (Latin ago, Greek ἄγω) in the sense of "nimble, agile". from Indo-European root Ag or "to move", with the cognates Latin ignis (the root of English ignite), Sclavonian ogni; Russian огонь (ogon), Polish "ogień", Slovenian "ogenj", Serbian oganj, and Lithuanian ugnis — all with the meaning "fire", with the reconstructed Proto-Indo-European root being h₁égni-. There are many theories about the origins of the god Agni, some tracing it to Indo-European mythologies, others tracing to mythologies within the Indian tradition. The origin myth found in many Indo-European cultures is one of a bird, or bird like being, that carries or brings fire from the gods to mankind. Alternatively, this messenger brings an elixir of immortality from heaven to earth. In either case, the bird returns everyday with sacrificial offerings for the gods, but sometimes the bird hides or disappears without trace. Agni is molded in similar mythical themes, in some hymns with the phrase the "heavenly bird that flies". The earliest layers of the Vedic texts of Hinduism, such as section 6.1 of Kathaka Samhita and section 1.8.1 of Maitrayani Samhita state that the universe began with nothing, neither night nor day existed, what existed was just Prajapati (also referred to as Brahman). Agni originated from the forehead of Prajapati, assert these texts. With the creation of Agni came light, and with that were created day and night. Agni, state these Samhitas, is the same as the Brahman, the truth, the eye of the manifested universe. These mythologies develop into more complex stories about Agni's origins in the later layers of Vedic texts, such as in section 2.1.2 of the Taittiriya Brahmana and sections 2.2.3–4 of Shatapatha Brahmana. Agni seated on a ram, 14th–15th century Indonesia. The Vedas describe the parents of Agni as two kindling fire sticks, whose loving action creates him. Just born, he is poetically presented as a tender baby, who needs loving attention lest he vanishes. With care, he sparks and smokes, then flames and grows stronger than his parents, finally so strong that he devours what created him. The hymns in these ancient texts refer to Agni with numerous epithets and synonyms, such as Jatavedas (one with knowledge of all births and successions), Vaishvanara (one who treats all equally), Tanunapat (son of himself, self-made), Narasamsa (praised by all men), Tripatsya (with three dwellings), and many others. In Vedic mythologies, Agni is also presented as one who is mysterious with a tendency to play hide and seek, not just with humans but with the gods. He hides in strange places such as waters where in one myth he imbues life force into living beings that dwell therein, and in another where the fishes report his presence to the gods. Agni is in hymn 10.124 of the Rigveda, a Rishi (sage-poet-composer) and along with Indra and Surya makes up the Vedic triad of deities. Agni features prominently in the major and minor Upanishads of Hinduism. Among the earliest mention is the legend of a boy named Satyakama, of uncertain parentage from an unwed mother, in chapter 4 of the Chandogya Upanishad (~700 BCE). He honestly admits his poverty and that his mother does not know who his father was, an honesty that earns him a spot in a Vedic school (gurukul). During his studies, the boy meets Agni, who then becomes the metaphor for him as a cardinal direction, world body, eye and knowledge, and the abstract principle of Brahman which the Upanishad states is in everything and is everywhere. Agni appears in section 1.13 of Chandogya Upanishad as well. In verse 18 of the Isha Upanishad, Agni is invoked with, "O Agni, you know all the paths, lead me on to success by the good path, keep me away from the wrong path of sin". [note 3] In sections 4.5–6 of the Maitri Upanishad, students ask their Vedic Guru (teacher) about which god is best among gods they name, a list that includes Agni. The Guru replies that they are all supreme, all merely forms of the Brahman, the whole world is Brahman. So pick anyone, suggests the Upanishad, meditate and adore that one, then meditate over them all, then deny and discard the individuality of every one of these gods including of Agni, thus journey unto the universal, for a communion with the Purusha, the Atman. Sections 3 and 4 of Kena Upanishad, another major ancient Upanishad, present an allegorical story which includes gods Agni, Vayu, Indra and goddess Uma. After a battle between good gods and evil demons, where Brahman helps the good gain victory, the gods wonder, "what is this Brahman, a wonderful being?" Agni goes first to find out, but fails. Vayu too fails. Then Indra tries, but meets the goddess who already understands Brahman, explains what Brahman is and how the good reached victory through the nature of Brahman. Indra shares this knowledge with Agni and Vayu. The Kena Upanishad closes these sections by stating that "Agni, Vayu and Indra" are revered first because they were the first among gods to realize Brahman. The allegorical legend, states Paul Deussen, aims to teach that all the Vedic gods and natural phenomenon have their basis in the timeless, universal monistic principle called Brahman. Another ancient major Hindu scripture named Prashna Upanishad mentions Agni in its second Prashna (question section). The section states that Agni and other deities manifest as five gross constituents that combine to make the entire universe, and that all the deities are internalized in the temple of a living body with Agni as the eyes. Agni is mentioned in many minor Upanishads, such as the Pranagnihotra Upanishad, the Yogatattva Upanishad, the Yogashikha Upanishad, the Trishikhibrahmana Upanishad and others. The syncretic and monistic Shaivism text, namely Rudrahridaya Upanishad states that Rudra is same as Agni, and Uma is same as Svaha. Vedic rituals involve Agni. He is a part of many Hindu rites-of-passage ceremonies such as celebrating a birth (lighting a lamp), prayers (aarti lamp), at weddings (the yajna where the bride and groom circle the fire seven times) and at death (cremation). According to Atharvaveda, it is Agni that conveys the soul of the dead from the pyre to be reborn in the next world or life. However, this role was in post-Vedic texts subsumed in the role of god Yama. Agni has been important in temple architecture, is typically present in the southeast corner of a Hindu temple. Saptapadi, a Hindu wedding ritual, around Agni in progress. The most important ritual of Hindu weddings is performed around Agni. It is called the Saptapadi (Sanskrit for "seven steps/feet") or Sat Phere, and it represents the legal part of Hindu marriage. 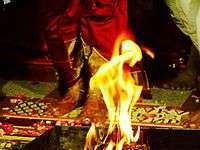 The ritual involves a couple completing seven actual or symbolic circuits around the Agni, which is considered a witness to the vows they make to each other. Each circuit of the consecrated fire is led by either the bride or the groom, varying by community and region. With each circuit, the couple makes a specific vow to establish some aspect of a happy relationship and household for each other, with Agni as the divine witness to those mutual vows. In Central India and Suriname, the bride leads the first three or four circuits. The Agnihotra involves fire, and the term refers to the ritual of keeping fire at home, and in some cases making "sacrificial offerings" such as milk and seeds to this fire. The Srauta texts state that it is the duty of man to perform Agnihotra. A wide range of Agnihotra procedures are found in the Brahmana layer of the Vedas, ranging from the most common simple keeping of sacred fire and its symbolism, to more complicated procedures for the expiation of guilt, to rituals claimed to grant immortality to the performer. According to the Jaiminiya Brahmana, for example, an Agnihotra sacrifice frees the performer from evil and death. In contrast, states the Shatapatha Brahmana, Agnihotra is a symbolic reminder and equivalent to the Sun, where the fire keeper is reminded of the heat that creates life, the fire in beings, the heat in the womb behind the cycle of life. Agni is a part of the ritual grammar in many Hindu festivals. Above Holika for Holi, includes Agni. Two major festivals in Hinduism, namely Holi (festival of colors) and Diwali (festival of lights) incorporate Agni in their ritual grammar, as a symbol of divine energy. During the autumn celebrations of Diwali, traditional small fire lamps called Diya are included to mark the festivities. For Holi, Hindus burn bonfires as Holika, on the night before the spring festival. The bonfire marks god Agni, and in rural India mothers carry their babies around the fire clockwise on Holika in Agni's remembrance. Jātaveda is the fire that carries the quid-pro-quo offerings to the gods, in which case Agni is light identified with knowledge and with Brahman. In the Jātaveda form, "He who knows all creatures", Agni acts as the divine model for the priest. He is the messenger who carries the oblation from humans to the gods, bringing the Gods to sacrifice, and intercedes between gods and humans (Rig Veda I.26.3). Together with Indra, Soma, Agni is invoked in the Rig Veda more than any other gods. Kravyād (क्रव्याद) is the form of Agni which cremates corpses, the fire of the funeral pyre that triggers the recycling of matter and spirit. In this way, states Shatapatha Brahmana in verse 2.2.4.8, after one's death and at the time of cremation, Agni heats up and burns only the body, yet by its heat, one is reborn. One of Agni's epithets is Abhimāni (from Sanskrit: abhi (towards) + man (the verbal root man 'to think', 'reflect upon') meaning dignified, proud; longing for, thinking. Agni is a symbol of piety and purity. As expression of two kinds of energy i.e. light and heat, he is the symbol of life and activity. Agni is symbolism for psychological and physiological aspects of life, states Maha Purana section LXVII.202–203. There are three kinds of Agni inside every human being, states this text, the krodha-agni or "fire of anger", the kama-agni or "fire of passion and desire", and the udara-agni or "fire of digestion". These respectively need introspective and voluntary offerings of forgiveness, detachment and fasting, if one desires spiritual freedom and liberation. Agni variously denotes the natural element fire, the supernatural deity symbolized by fire and the inner natural will aspiring for the highest knowledge. Heat, combustion and energy is the realm of Agni which symbolizes the transformation of the gross to the subtle; Agni is the life-giving energy. Agnibija is the consciousness of tapas (proto-cosmic energy); agni (the energizing principle); the sun, representing the Reality (Brahman) and the Truth (Satya), is Rta, the order, the organizing principle of everything that is. Agni, who is addressed as Atithi ('guest'), is also called Jatavedasam (जातवेदसम्), meaning "the one who knows all things that are born, created or produced." He symbolizes will-power united with wisdom. Agni is the essence of the knowledge of Existence. Agni destroys ignorance and all delusions, removes nescience. The Kanvasatpathabrahmanam (SB.IV.i.iv.11) calls Agni "wisdom". [note 4] Agni is symbolism for "the mind swiftest among (all) those that fly." It also symbolises the soul; it is the power of change that cannot be limited or overcome. Light, heat, colour and energy are merely its outer attributes; inwardly, agni impels consciousness, perception and discernment. The icons for Agni show wide regional variations. Left: Agni on ram, Right: Agni with goddess Svaha. The iconography of Agni varies by region. The design guidelines and specifications of his iconography are described in the Hindu Agama texts. He is shown with one to three heads, two to four armed, is typically red-complexioned, standing next to or riding a ram, with a characteristic dramatic halo of flames leaping upwards from his crown. He is shown as a strong looking man, sometimes bearded, with a large belly because he eats everything offered into his flames, with golden brown hair, eyes and mustache to match the color of fire. Agni holds a rosary in one hand to symbolize his prayer-related role, and a sphere in another hand in eastern states of India. In other regions, his four arms hold an ax, torch, spoon (or fan) and a flaming spear (or rosary). Seven rays of light or flames emit from his body. One of his names is Saptajihva, "the one having seven tongues", to symbolize how rapidly he consumes sacrificial butter. 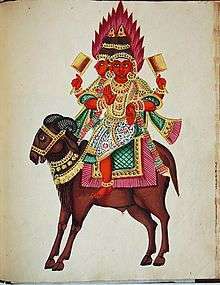 Occasionally, Agni iconography is shown in Rohitasva form, which has no ram as his vahana, but where he is pulled in a chariot with seven red horses, and the symbolic wind that makes fire move as the wheels of the chariot. The number seven symbolizes his reach in all seven mythical continents in ancient Hindu cosmology or colors of a rainbow in his form as the sun. Agni has three forms, namely fire, lightning and the Sun, forms sometimes symbolized by giving his icon three heads or three legs. He sometimes is shown wearing a garland of fruits or flowers, symbolic of the offerings made into the fire. Agni god in southeast corner of the 11th-century Rajarani Temple in Bhubaneshwar Odisha. The ram is carved below him. The earliest surviving artwork of Agni have been found at archaeological sites near Mathura (Uttar Pradesh), and these date from 1st-century BCE. 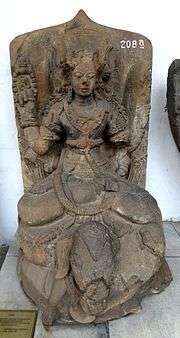 In the collection at Bharat Kalā Bhavan, there is a red sandstone sculpture from around the start of the common era but no later than 1st-century CE, identifiable as Agni shown in the garb of a Brahmin, very much like sage Kashyapa. In the Panchala coins of Agnimitra, a deity is always present with a halo of flames. 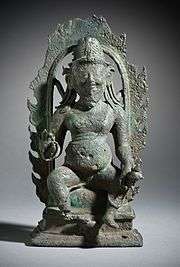 In Gupta sculptures, Agni is found with a halo of flames round the body, the sacred thread across his chest, a beard, pot-bellied and holding in his right hand a amrtaghata (nectar-pot). Many of these early carvings and early statues show just one head, but elaborate details such as ear-rings made of three fruits, a detailed necklace, a slightly smiling face wearing a crown, and flames engraved into the hairs at the back of Agni's statue. The iconographic statues and reliefs of god Agni are typically present in the southeast corners of a Hindu temple. However, in rare temples where Agni is envisioned as a presiding astrological divinity, according to texts such as the Samarangana Sutradhara, he is assigned the northeast corner. Agni is historically considered to be present in every grihastha (home), and therein presented in one of three forms – gārhapatya (for general domestic usage), āhavaniya (for inviting and welcoming a personage or deity) and dakshinagni (for fighting against all evil). Yāska states that his predecessor Sākapuṇi regarded the threefold existence of Agni as being in earth, air and heaven as stated by the Rig Veda, but a Brāhmana considered the third manifestation to be the Sun. Agni (right) with his son Skanda (Karttikeya), about 1st-century CE. Goddess Svaha is Agni's wife. Her name is pronounced with offerings such as butter and seeds poured into the fire during ceremonies. However, like many names in Hindu traditions, the name Svaha embeds symbolic meanings, through its relationship with the Vedic word Svadha found in the hymns of the Rigveda. Thomas Coburn states that the term Svadha refers to "one's own particular nature or inclination", and the secondary sense of "a customary pleasure or enjoyment, a refreshment that nourishes". Svaha is also found in the hymns of the Vedic literature, in the sense of "welcome, praise to you". This salutation is a remembrance of Agni, as an aspect of that which is "the source of all beings". As a goddess and wife of Agni, Svaha represents this Shakti. 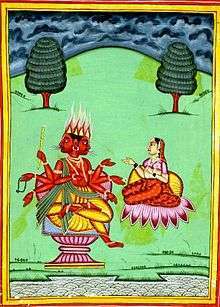 In the text Devi Mahatmya of the goddess tradition of Hinduism (Shaktism), and in the Hindu mythologies, Svaha is the daughter of goddess Daksha, Svaha has a crush for Agni. She seduces him by successively impersonating six of seven women at a gurukul (school) that Agni desired for, and thus with him has a baby who grows to become god Skanda – the god of war. Agni is identified with same characteristics, equivalent personality or stated to be identical as many major and minor gods in different layers of the Vedic literature, including Vayu, Soma, Rudra (Shiva), Varuna and Mitra. In hymn 2.1 of the Rigveda, in successive verses, Agni is identified to be the same as twelve gods and five goddesses. Prajapati: The vedic text Shatapatha Brahmana, in section 6.1.2 describes how and why Prajapati is the father of Agni, and also the son of Agni, because they both are the image of the one Atman (Soul, Self) that was, is and will be the true, eternal identity of the universe. The Prajapati, cosmic Purusha and Agni are stated to be the same in sections 6.1.1 and 6.2.1 of Shatapatha Brahmana. Varuna and Mitra: when Agni is born, he is Varuna; when he is kindled, he is Mitra. He is also stated to become Varuna in the evening, and he is Mitra when he rises in the morning. Indra: Agni is generally presented as Indra's twin, they both go and appear together. In chapter 13.3 of the Atharvaveda, Agni is said to become Indra when he illumines the sky. Agni is also called Vishva-Vedāh,[note 5] "dawn," which refers both to Indra, the Protector, and to the all-knowing Agni. Rudra: in the Rig Veda Agni is addressed as having the same fierce nature as Rudra. [note 6][note 7] The Shiva-linga represents that pillar of fire which is Agni, a Skambha symbolism borrowed in some Buddhist artworks. The verses 8 through 18 in section 6.1.3 of the Shatapatha Brahmana state Rudra is same as Agni, who is known by many other names. Later, in section 9.1.1, the Shatapatha Brahmana states, "this entire Agni (fire altar) has now been completed, he is now this god Rudra". Savitr (Sun): Agni is same as Savitr during the day, as he traverses the space delivering light and energy to all living beings. Vayu and Soma: in the Vedas, Agni or 'fire' (light and heat), Vayu or 'air' (energy and action), and Soma or 'water', are major deities who cooperate to empower all life. In some passages, they are stated to be aspects of the same energy and principle that transforms. Gayatri: is identified with Agni in Aitareya Brahmana section 1.1, Jaiminiya Brahmana section 3.184 and Taittiriya Brahmana section 7.8, and the most revered Gayatri meter in the Sanskrit prosody and Hindu traditions is associated with Agni. Vāc (goddess of speech) and Prana (life force): are identified with Agni in Jaiminiya Brahmana sections 1.1 and 2.54, Shatapatha Brahmana sections 2.2.2 and 3.2.2. Sarama: in a hymn in praise of Agni,[note 8] Rishi Parāśara Śāktya speaks of Saramā, the goddess of Intuition, the forerunner of the dawn of Truth in the Human mind, who finds the Truth which is lost. [note 9] It is Saramā who is a power of the Truth, whose cows are the rays of the dawn of illumination and who awakens man who finds Agni standing in the supreme seat and goal. A pre-3rd century CE, Kushan Empire era red colored Agni statue. A sage of the Rig Veda (Sukta IV.iii.11) states that the Sun became visible when Agni was born. Offended by Agni, Bhrigu had cursed Agni to become the devourer of all things on this earth, but Brahma modified that curse and made Agni the purifier of all things he touched. In the "Khandava-daha Parva" (Mahabharata CCXXV), Agni in disguise approaches Krishna and Arjuna seeking sufficient food for gratification of his hunger; and on being asked about the kind of food which would gratify, Agni expressed the desire to consume the forest of Khandava protected by Indra for the sake of Takshaka, the chief of the Nagas. Aided by Krishna and Arjuna, Agni consumes the Khandava Forest, which burnt for fifteen days, sparing only Aswasena, Maya, and the four birds called sarangakas; later, as a boon Arjuna got all his weapons from Indra and also the bow, Gandiva, from Varuna. There is the story about King Shibi who was tested by Agni assuming the form of a pigeon and by Indra assuming the form of a hawk; Shibi offered his own flesh to the hawk in exchange of pigeon's life. The pigeon which had sought Shibi's shelter was thus saved by the king's sacrifice. Agniparikshā or 'the Fire test' has Agni as the witness. In the Ramayana, Sita voluntarily goes through this ordeal to prove her virtue. Agni is the eldest son of Brahma. In the Visnu Purana, Agni, called Abhimāni is said to have sprung from the mouth of the Virat purusha, the Cosmic Man. In another version, Agni emerged from the ritual fire produced by the wife of Dharma (eternal law) named Vasubhāryā (literally, "daughter of Light"). According to the Puranic mythology, Agni married Svāhā (invocation offering) and fathered three sons - Pāvaka (purifier), Pāvamāna (purifying) and Śuchi (purity). From these sons, he has forty-five grandchildren which are symbolic names of different aspects of a fire. In some texts, Medhā (intelligence) is Agni's sister. Right: Agni as four handed Katen deity in 17th-century Japanese art. Agni (or Aggi) has been a part of the Mahayana Buddhist tradition. He is, for example, one of the fifty one Buddhist deities found in Tibetan Buddhism mandala for the medicine Buddha. His iconography is part of a set of works for Buddhist Manjushri's mandalas as well, in Tibetan art, where he is depicted with Brahma and Indra. The Tibetan iconography for Agni matches closely with some found in the Hindu tradition, with red colors, a ram or goat, conical hair and crown, a goatee style beard, holding a pot of water or fire in one hand, and rosary beads in the other. The overall environment of the art works includes Buddhist themes as well as such as the dharma wheel, white conch, golden fish, elephant, and karma cycle depicting endless knot. In the Theravada Buddhist traditions, such as those found in Thailand, Agni is a minor deity. Agni is called Phra Phloeng (also spelled Phra Plerng, literally, holy flames). The iconography for Phra Phloeng in Thai arts shows him with two faces, eight arms, red color, a headdress that is of the shape of a gourd, and he emits flames. The medieval era Thai texts describe him as a deity with seven tongues, a purple crown of smoke, and fiery complexion. He rides a horse chariot, a rhinoceros or a ram. Phra Phloeng wife in these texts is stated to be Subanee, or Garudee, or Swaha. Some Thai texts state Nilanon to be their son. Agni is also one of the twelve Devas, as guardian deities found in or around Buddhist shrines called Jūni-ten (十二天) in Japanese Buddhism. Agni, in Japan, has been called "Ka-ten". In Tibetan Buddhist monasteries and shrines, Agni is also the guardian of the southeast. He joins these other eleven Devas of Buddhism, found in Japan and other parts of southeast Asia: Indra (Taishaku-ten), Yama (Emma-ten), Nirrti (Rasetsu-ten), Vayu (Fu-ten), Ishana (Ishana-ten), Kubera (Tamon-ten), Varuna (Sui-ten), Brahma (Bon-ten), Prithvi (Chi-ten), Surya (Nit-ten), Chandra (Gat-ten). Agni appears in many Buddhist canonical texts, but not in the sense of a Vedic god, rather it appears in the Upanishadic knowledge and inner heat metaphorical sense. The Aggi-Vacchagotta-Sutta found in the Pali text Majjhima Nikaya, presents the much discussed exchanges between Buddha and his contemporary colleague named Srenika (Pali: Senika). The conversations between Buddha and Srenika have remained a part of a historic debate, one that continues in modern Buddhism. It is called the Senika heresy (also spelled Shrenika heresy, or Senni-godo in Japan). Srenika suggested that there is an eternal Self (Atman, soul, permanent Tathagata) that lives in a temporary physical body and one that is involved in rebirth. In the Buddhist traditions, the Buddha taught there is rebirth and Anatta, or that there is no eternal Self. The Pali texts state that Shrenika disagreed and asked the Buddha many questions, which the Buddha refused to answer, calling his questions as indeterminate; Buddha clarified that were he to answer Srenika's questions it would entangle him. The Buddha explains his ideas with the metaphor of Agni, stating that just like fire is extinguished and no longer exists after it is extinguished, in the same way all skandha that constitute to form a human being are extinguished after death. Different versions of this debate appears in other canonical texts of Buddhism, such as the Mahaparinirvana Sutta, Mahaprajna-paramita-sastra and Samyutta Nikaya; in some versions, Shrenika offers his own simile of Agni to further his views. Major historic Buddhist scholars such as Nagarjuna have extensively commented on the Srenika heresy. In the Buddhist traditions, Srenika is not considered a Buddhist, rather one from the competing Brahman-oriented Vedic thought. In a manner similar to the Hindu texts, the Buddhist texts also treat Agni (Tejas) as a fundamental material quality and building block of nature. For example, in section 11.31 of Visuddhimagga and in Dhamma-sangani Rupakanda, Agni-Tejas is credited as that which warms, ages, burns and digests food and life processes. The word Agni in Jainism refers to fire, but not in the sense of Vedic ideas. Agni appears in Jain thought, as a guardian deity and in its cosmology. He is one of the eight dikpalas, or directional guardian deities in Jain temples, along with these seven: Indra, Yama, Nirrti, Varuna, Vayu, Kubera and Isana. They are typically standing, with their iconography is similar to those found in Hindu and Buddhist temple pantheon. In ancient Jain thought, living beings have souls and exist in myriad of realms, and within the earth realm shared by human beings, there are two kinds of beings: mobile and immobile. The mobile beings – which includes tiny insects, birds, aquatic life, animals and human beings – have two or more senses, while the immobile beings have only a single sense (ekenderiya). Among the single sense beings are plant beings, air beings (whirlwind[note 10]), earth beings (clay), water beings (dew drop) and fire beings (burning coal, meteor, lightning). The last class of beings are Agni-bodies, and these are believed to contain soul and fire-bodied beings. Ahimsa, or non-violence, is the highest precept in Jainism. In their spiritual pursuits, Jain monks go to great lengths to practice Ahimsa; they neither start Agni nor extinguish Agni because doing so is considered violent to "fire beings" and an act that creates harmful Karma. Agni-kumara or "fire princes" are a part of Jain theory of rebirth and a class of reincarnated beings. Agni or Tejas are terms used to describe substances and concepts that create beings, and in which transmigrating soul gets bound according to Jainism theology. Agni, as constitutive principle of fire or heat, was incorporated in Hindu texts of ancient medicine such as the Charaka Samhita and Sushruta Samhita. It is, along with Soma, the two classification premises in the pre-4th century CE medical texts found in Hinduism and Buddhism. Agni-related category, states Dominik Wujastyk, included that of "hot, fiery, dry or parched" types, while Soma-related category included "moist, nourishing, soothing and cooling" types. This classification system was a basis of grouping medicinal herbs, seasons of the year, tastes and foods, empirical diagnosis of human illnesses, veterinary medicine, many other aspects of health and lifestyle. Agni was viewed as the life force in a healthy body, the power to digest foods, and innate in food. In Ayurveda, states Fleischman, "the amount of Agni determines the state of health". Agni is an important entity in Ayurveda. Agni is the fiery metabolic energy of digestion, allows assimilation of food while ridding the body of waste and toxins, and transforms dense physical matter into subtle forms of energy the body needs. Jathar-agni determines the production of hydrochloric acid in the stomach, Bhuta-agni determines the production of bile in the liver, Kloma-agni determines the production of sugar-digesting pancreatic enzymes and so forth. The nature and quality of these agnis depend on one's dosha which can be – vata, pitta or kapha. Agni is also known as Vaisvanara. Just as the illuminating power in the fire is a part of Agni's own effulgence, even so the heating power in the foods digestive and appetizing power is also a part of Agni's energy or potency. ↑ Other hymns of the Rigveda link Ṛta (cosmic harmony) to other Vedic deities, such as verse 10.133.6 calls on Indra for guidance on Ṛta. ↑ This prayer to Agni appears in Rigveda verse 1.89.1, composed before 1200 BCE. ↑ He says – विदद् गव्यं सरमा दृहमूर्वमं येना नु कं मानुषी भोजते विट् – "Saramā discovered the strong and wide places of the hidden knowledge; this discovery brings happiness to all human beings". ↑ For other examples from Uttaradhyayana Sutra text of Jainism, see Chapple. ↑ George M. Williams (2008). Handbook of Hindu Mythology. Oxford University Press. p. 48. ISBN 978-0-19-533261-2. ↑ Wendy Doniger O'Flaherty (1994). Hindu Myths. Penguin Books. p. 97. ISBN 978-0-14-400011-1. ↑ Antonio Rigopoulos (1998). Dattatreya: The Immortal Guru, Yogin, and Avatara: A Study of the Transformative and Inclusive Character of a Multi-faceted Hindu Deity. State University of New York Press. p. 72. ISBN 978-0-7914-3696-7. ↑ Alexandra Anna Enrica van der Geer (2008). Animals in Stone: Indian Mammals Sculptured Through Time. BRILL Academic. p. 324. ISBN 90-04-16819-2. 1 2 Patrick Olivelle (1998). The Early Upanishads: Annotated Text and Translation. Oxford University Press. p. 18. ISBN 978-0-19-535242-9. 1 2 3 4 5 James G. Lochtefeld (2002). The Illustrated Encyclopedia of Hinduism: A-M. The Rosen Publishing Group. pp. 14–15. ISBN 978-0-8239-3179-8. 1 2 3 Stephanie W. Jamison; Joel P. Brereton (2014). The Rigveda: 3-Volume Set. Oxford University Press. pp. 40–41. ISBN 978-0-19-972078-1. ↑ Alexander Wynne (2007). The Origin of Buddhist Meditation. Routledge. pp. 31–32. ISBN 978-1-134-09741-8. ↑ Kapila Vatsyayan (1995). Prakr̥ti: Vedic, Buddhist, and Jain traditions. Indira Gandhi National Centre for the Arts. pp. 7, 94–95. ISBN 978-81-246-0038-2. ↑ Richard Payne (2015). Michael Witzel, ed. Homa Variations: The Study of Ritual Change Across the Longue Durée. Oxford University Press. pp. 1–3. ISBN 978-0-19-935158-9. ↑ Axel Michaels (2016). Homo Ritualis: Hindu Ritual and Its Significance for Ritual Theory. Oxford University Press. pp. 237–248. ISBN 978-0-19-026263-1. 1 2 3 4 George M. Williams (2008). Handbook of Hindu Mythology. Oxford University Press. pp. 48–51. ISBN 978-0-19-533261-2. ↑ Tadeusz Skorupski (2015). Michael Witzel, ed. Homa Variations: The Study of Ritual Change Across the Longue Durée. Oxford University Press. pp. 78–84. ISBN 978-0-19-935158-9. 1 2 Edward Washburn Hopkins (1968). Epic Mythology. Biblo & Tannen. pp. 97–99. ISBN 978-0-8196-0228-2. 1 2 Bettina Bäumer; Kapila Vatsyayan (1988). Kalatattvakosa: A Lexicon of Fundamental Concepts of the Indian Arts. Motilal Banarsidass. pp. 203–204. ISBN 978-81-208-1402-8. ↑ T. W. Rhys Davids; William Stede (1905). The Pali-English Dictionary. Asian Educational Services. pp. 4–5. ISBN 978-81-206-1273-0. 1 2 3 4 5 6 Robert E. Buswell Jr.; Donald S. Lopez Jr. (2013). The Princeton Dictionary of Buddhism. Princeton University Press. pp. 852, 962. ISBN 978-1-4008-4805-8. ↑ Masao Abe; Steven Heine (1992). A Study of Dogen: His Philosophy and Religion. State University of New York Press. pp. 158–162. ISBN 978-0-7914-0837-7. 1 2 Christopher Key Chapple (2006). Jainism and Ecology: Nonviolence in the Web of Life. Motilal Banarsidass. pp. 31, 43–44, 56, 173–175. ISBN 978-81-208-2045-6. 1 2 Helmuth von Glasenapp (1999). Jainism: An Indian Religion of Salvation. Motilal Banarsidass. pp. 263–264. ISBN 978-81-208-1376-2. ↑ Bettina Bäumer; Kapila Vatsyayan (1988). Kalatattvakosa: A Lexicon of Fundamental Concepts of the Indian Arts. Motilal Banarsidass. pp. 226–227. ISBN 978-81-208-1402-8. 1 2 Sir Monier Monier-Williams; Ernst Leumann; Carl Cappeller (2002). A Sanskrit-English Dictionary: Etymologically and Philologically Arranged with Special Reference to Cognate Indo-European Languages. Motilal Banarsidass. pp. 5–6. ISBN 978-81-208-3105-6. 1 2 Arthur Anthony Macdonell (1898). Vedic Mythology. Motilal Banarsidass. pp. 15–16, 92–93. ISBN 978-81-208-1113-3. ↑ William Norman Brown; Rosane Rocher (1978). India and Indology: Selected Articles. Motilal Banarsidass. pp. 59–61. ↑ Surendranath Dasgupta (1933). A History of Indian Philosophy:. Cambridge University Press. pp. 73–76. ISBN 978-0-521-04779-1. ↑ Jan Gonda (1980). "Deities and their position and function". Handbuch Der Orientalistik: Indien. Zweite Abteilung. BRILL Academic. pp. 301–302. ISBN 90-04-06210-6. ↑ Annette Wilke; Oliver Moebus (2011). Sound and Communication: An Aesthetic Cultural History of Sanskrit Hinduism. Walter de Gruyter. pp. 418 with footnote 147. ISBN 978-3-11-024003-0. ↑ Lakshman Sarup (1998). The Nighantu and the Nirukta. Motilal Banarsidass. p. 120. ISBN 81-208-1381-2. ↑ Arthur Anthony Macdonell (1898). Vedic Mythology. Motilal Banarsidass. p. 99. ISBN 978-81-208-1113-3. ↑ Hervey De Witt Griswold (1971). The Religion of the Ṛigveda. Motilal Banarsidass Publishe. pp. 160 footnote 2. ISBN 978-81-208-0745-7. ↑ Maurice Phillips (1895). The Teaching of the Vedas: What Light Does it Throw on the Origin and Development of Religion?. Longmans Green. p. 57. ↑ Jaan Puhvel (2011). Words beginning with PA. Walter de Gruyter. pp. 25–26. ISBN 978-3-11-023865-5. 1 2 3 4 H. W. Bodewitz (1976). The Daily Evening and Morning Offering (Agnihotra) According to the Brāhmanas. Motilal Banarsidass. pp. 14–19. ISBN 978-81-208-1951-1. 1 2 Wendy Doniger O'Flaherty (1994). Hindu Myths. Penguin Books. pp. 97–98. ISBN 978-0-14-400011-1. ↑ Wendy Doniger (1981). The Rig Veda: An Anthology : One Hundred and Eight Hymns, Selected, Translated and Annotated. Penguin Books. pp. 80, 97. ISBN 978-0-14-044402-5. ↑ The Vedic idea that the sun, lightning and fire were different manifestation of the same element and principle is summarized in many Hindu texts, such as the ancient Bṛhaddevatā. 1 2 3 4 5 Bettina Bäumer; Kapila Vatsyayan (1988). Kalatattvakosa: A Lexicon of Fundamental Concepts of the Indian Arts. Motilal Banarsidass. pp. 225–226. ISBN 978-81-208-1402-8. ↑ Alain Daniélou (1991). The Myths and Gods of India: The Classic Work on Hindu Polytheism from the Princeton Bollingen Series. Inner Traditions. pp. 106–107. ISBN 978-0-89281-354-4. 1 2 Merv Fowler (1999). Buddhism: Beliefs and Practices. Sussex Academic Press. pp. 6–7. ISBN 978-1-898723-66-0. ↑ Wendy Doniger (1988). Textual Sources for the Study of Hinduism. Manchester University Press. pp. 6–7. ISBN 978-0-7190-1866-4. ↑ William K. Mahony (1998). The Artful Universe: An Introduction to the Vedic Religious Imagination. State University of New York Press. p. 123 verse 8. ISBN 978-0-7914-3580-9. ↑ William K. Mahony (1998). The Artful Universe: An Introduction to the Vedic Religious Imagination. State University of New York Press. pp. 46–55. ISBN 978-0-7914-3580-9. 1 2 Stephanie W. Jamison; Joel P. Brereton (2014). The Rigveda: 3-Volume Set. Oxford University Press. pp. 41–42. ISBN 978-0-19-972078-1. ↑ Arthur Anthony Macdonell (1898). Vedic Mythology. Motilal Banarsidass. pp. 71, 93–95, 99–100. ISBN 978-81-208-1113-3. ↑ Wendy Doniger O'Flaherty (1994). Hindu Myths. Penguin Books. pp. 97–101. ISBN 978-0-14-400011-1. ↑ Encyclopaedia of the Hindu World Vol.1. Concept Publishing Company. p. 210. ↑ Wendy Doniger (1981). The Rig Veda: An Anthology : One Hundred and Eight Hymns, Selected, Translated and Annotated. Penguin Books. p. 80. ISBN 978-0-14-044402-5. ↑ Paul Deussen (1990). Sixty Upaniṣads of the Veda, Part 2. Motilal Banarsidass. p. 551. ISBN 978-81-208-0430-2. ↑ Paul Deussen (1980). Sixty Upaniṣads of the Veda, Part 1. Motilal Banarsidass. pp. 343–344. ISBN 978-81-208-1468-4. 1 2 3 4 Paul Deussen (1980). Sixty Upaniṣads of the Veda, Part 1. Motilal Banarsidass. pp. 207–208, 211–213 verses 14–28. ISBN 978-81-208-1468-4. ↑ Paul Deussen (1990). Sixty Upaniṣads of the Veda, Part 2. Motilal Banarsidass. pp. 592–593. ISBN 978-81-208-0430-2. ↑ Ayyangar, TR Srinivasa (1938). The Yoga Upanishads. The Adyar Library. pp. 92, 314, 355, 378. ↑ Ayyangar, TRS (1953). Saiva Upanisads. Jain Publishing Co. (Reprint 2007). p. 196. ISBN 978-0-89581-981-9. ↑ Hattangadi, Sunder (2000). "रुद्रहृदयोपनिषत् (Rudrahridaya Upanishad)" (PDF) (in Sanskrit). p. 2. Retrieved 2 March 2016. ↑ H. W. Bodewitz (1976). The Daily Evening and Morning Offering: (Agnihotra) According to the "Brāhmaṇas. BRILL Academic. pp. 1–4. ISBN 90-04-04532-5. ↑ H. W. Bodewitz (1976). The Daily Evening and Morning Offering: (Agnihotra) According to the "Brāhmaṇas. BRILL Academic. pp. 5–14. ISBN 90-04-04532-5. ↑ Essays in Indian Philosophy, Religion and Literature. Motilal Banarsidass. pp. 54, 55. ↑ The Satapatha-Brahmana. pp. 327–329. 1 2 Jeaneane D. Fowler (1997). Hinduism: Beliefs and Practices. Sussex Academic Press. p. 71. ISBN 978-1-898723-60-8. ↑ Elizabeth Peirce (2003). Multi-Faith Activity Assemblies. Routledge. pp. 238–239. ISBN 1-134-41163-4. ↑ Stephen P. Huyler (2002). Meeting God: Elements of Hindu Devotion. Yale University Press. pp. 60–64. ISBN 978-0-300-08905-9. ↑ Danielle Feller. Sanskrit Epics. Motilal Banarsidass. p. 91. ↑ Walter O.Kaelber. Tapta Marga: Asceticism and Initiation in Vedic India. State University of New York Press. pp. 36, 37, 52. ↑ John A.Grimes. A Concise Dictionary of Indian Philosophy. SUNY Press. p. 18. ↑ Categorisation in Indian Philosophy. Ashgate Publishing. p. 14. ↑ Bina Gupta. An Introduction to Indian Philosophy. Routledge. pp. 22, 24. ↑ Jeaneane D. Fowler. Hinduism: Beliefs and Practices. Sussex Academic Press. p. 98. ↑ The transition to a Global Consciousness. Allied Publishers. p. 294. ↑ R.L.Kashyap. Agni in Rig Veda. Sri Aurobindo Kapali Sastry Institute of Vedic Culture. p. 14. ↑ Kanvasatpathabrahmanam Vol.3. Motilal Banarsidas. p. 21. ↑ The Rig Veda. Oxford University Press. p. 783. ↑ Roger Calverley. Crystal Yoga. Lotus Press. p. 244. ↑ Roshen Dalal (2010). Hinduism: An Alphabetical Guide. Penguin Books. p. 10. ISBN 978-0-14-341421-6. ↑ Anna Libera Dallapiccola (2010). South Indian Paintings: A Catalogue of the British Museum Collection. British Museum Press. p. 145. ISBN 978-0-7141-2424-7. 1 2 3 Alain Daniélou (1991). The Myths and Gods of India: The Classic Work on Hindu Polytheism from the Princeton Bollingen Series. Inner Traditions. pp. 88–89. ISBN 978-0-89281-354-4. 1 2 Charles Russell Coulter; Patricia Turner (2013). Encyclopedia of Ancient Deities. Routledge. p. 26. ISBN 978-1-135-96390-3. 1 2 Sonya Rhie Quantanilla. History of Early Stone Sculpture of Mathura. BRILL. pp. 215, 366–367, xix with caption for Figure 86. ↑ Sonya Rhie Quantanilla. History of Early Stone Sculpture of Mathura. BRILL. pp. 215–216. ↑ Stella Kramrisch; Raymond Burnier (1976). The Hindu Temple. Motilal Banarsidass. p. 33. ISBN 978-81-208-0223-0. ↑ B.K.Chaturvedi. Agni Purana. Diamond Pocket Books. pp. 18, 21. 1 2 Thomas B. Coburn (1988). Devī-Māhātmya: The Crystallization of the Goddess Tradition. Motilal Banarsidass. pp. 164–165. ISBN 978-81-208-0557-6. 1 2 Thomas B. Coburn (1988). Devī-Māhātmya: The Crystallization of the Goddess Tradition. Motilal Banarsidass. pp. 165–166, 317–318 with footnotes. ISBN 978-81-208-0557-6. 1 2 3 4 5 6 Arthur Anthony Macdonell (1898). Vedic Mythology. Motilal Banarsidass. p. 95. ISBN 978-81-208-1113-3. ↑ David Shulman; Guy S. Stroumsa (2002). Self and Self-Transformations in the History of Religions. Oxford University Press. pp. 24–25. ISBN 978-0-19-534933-7. 1 2 3 Bettina Bäumer; Kapila Vatsyayan (1988). Kalatattvakosa: A Lexicon of Fundamental Concepts of the Indian Arts. Motilal Banarsidass. p. 216. ISBN 978-81-208-1402-8. ↑ Bal Gangadhar Tilak. The Arctic Home of the Vedas. Arktos. pp. 88–93. ↑ Devdutt Pattanaik. 7 Secrets of Shiva. Westland. pp. 11–13. ↑ "Stone statue of Shiva as Lingodbhava". British Museum. ↑ Umakant Premanand Shah (1987). Jaina Iconography. Abhinav Publications. p. 11. ISBN 978-81-7017-208-6. 1 2 Doris Srinivasan (1997). Many Heads, Arms, and Eyes: Origin, Meaning, and Form of Multiplicity in Indian Art. BRILL Academic. pp. 78–79. ISBN 90-04-10758-4. ↑ Anna J. Bonshek. Mirror of Consciousness. Motilal Banarsidass. p. 135. ↑ Sri Aurobindo. The Secret of the Veda. Sri Aurobindo Ashram Publication. p. 218. ↑ Arthur Anthony Mcdonell. Vedic Mythology. Motilal Banarsidass. pp. 88–99. ↑ Encyclopaedia of the Hindu World Vol.1. Concept Publishing. pp. 210, 212. ↑ The Mahabharata Book 1. Sacred-texts.com. pp. 434–447. ↑ Eastern Wisdom. Wilder Publications. p. 200. 1 2 3 Alain Danielou. The Myths and Gods of India. Inner Traditions. p. 88. ↑ Eng Soon Teoh (2016). Medicinal orchids of Asia. Singapore: Springer. pp. 33–49. ISBN 978-3-319-24272-9. ↑ Steven Kossak; Jane Casey Singer; Robert Bruce-Gardner (1998). Sacred Visions: Early Paintings from Central Tibet. Metropolitan Museum of Art. pp. 68–69, 158–159. ISBN 978-0-87099-862-1. 1 2 3 Jack M. Clontz (2016). Khon Mask : Thailand Heritage. MOCA Bangkok. p. 250. ISBN 978-1-78301-872-7. ↑ Justin Thomas McDaniel; Lynn Ransom (2015). From Mulberry Leaves to Silk Scrolls: New Approaches to the Study of Asian Manuscript Traditions. University of Pennsylvania Press. pp. 26–27, 35. ISBN 978-0-8122-4736-7. ↑ Jack M. Clontz (2016). Khon Mask : Thailand Heritage. MOCA Bangkok. p. 318. ISBN 978-1-78301-872-7. 1 2 Edward Conze (1985). The Large Sutra on Perfect Wisdom: With the Divisions of the Abhisamayalankara. University of California Press. pp. 12–13, 101–102. ISBN 978-0-520-05321-2. ↑ Damien Keown (2006). Buddhist Studies from India to America: Essays in Honor of Charles S. Prebish. Routledge. p. 19. ISBN 978-1-134-19632-6. ↑ Peter Harvey (2013). An Introduction to Buddhism: Teachings, History and Practices. Cambridge University Press. pp. 231–233. ISBN 978-0-521-85942-4. ↑ Rōshi P.T.N.H. Jiyu-Kennett, (2016). Zen is Eternal Life. Routledge. p. 332. ISBN 978-1-317-21468-7. ↑ Peter Koslowski (2002). Progress, Apocalypse, and Completion of History and Life after Death of the Human Person in the World Religions. Springer. p. 27. ISBN 978-1-4020-0647-0. ↑ Sehdev Kumar (2001). A Thousand Petalled Lotus: Jain Temples of Rajasthan : Architecture & Iconography. Abhinav Publications. p. 18. ISBN 978-81-7017-348-9. ↑ Charles Russell Coulter; Patricia Turner (2013). Encyclopedia of Ancient Deities. Routledge. p. 152. ISBN 978-1-135-96390-3. ↑ For Osian Jain temple example: Asha Kalia (1982). Art of Osian Temples: Socio-economic and Religious Life in India, 8th-12th Centuries A.D. Abhinav Publications. pp. 130–131. ISBN 978-0-391-02558-5. 1 2 John E. Cort (2001). Jains in the World: Religious Values and Ideology in India. Oxford University Press. pp. 20–21. ISBN 978-0-19-803037-9. ↑ Neil Dalal; Chloë Taylor (2014). Asian Perspectives on Animal Ethics: Rethinking the Nonhuman. Routledge. p. 40. ISBN 978-1-317-74995-0. ↑ Christopher Key Chapple (2006). Jainism and Ecology: Nonviolence in the Web of Life. Motilal Banarsidass. pp. xiv–xviii, 3–8. ISBN 978-81-208-2045-6. ↑ Christopher Key Chapple (2006). Jainism and Ecology: Nonviolence in the Web of Life. Motilal Banarsidass. p. 56. ISBN 978-81-208-2045-6. ↑ Christopher Key Chapple (2006). Jainism and Ecology: Nonviolence in the Web of Life. Motilal Banarsidass. pp. 46, 31–48. ISBN 978-81-208-2045-6. ↑ Bettina Bäumer; Kapila Vatsyayan (1988). Kalatattvakosa: A Lexicon of Fundamental Concepts of the Indian Arts. Motilal Banarsidass. pp. 271–274. ISBN 978-81-208-1402-8. D. Wujastyk (2003). The Roots of Ayurveda: Selections from Sanskrit Medical Writings. Penguin. pp. xviii, 74, 197–198. ISBN 978-0-14-044824-5. ↑ Guha, Amala (2006). "Ayurvedic Concept of Food and Nutrition". Ayurveda Health and Nutrition. University of Connecticut. Retrieved 2016-10-12. ↑ Yoga Journal Sep-Oct 2003. Active Interest Media. p. 38. Wikimedia Commons has media related to Agni (God).